Berlin and experimental noise music go way back, back to the Dada patrons and the Fluxus network, back to a time before MAC laptops and digital audio, if you can imagine such a thing. In the 80s, Berlin Atonal was the pinnacle showcase for revolutionary experimental acts such as Psychic TV, Einstürznede Neubauten, and Die Haut, among many others. In 1990, the festival was shut down as the Wall crumbled across the now re-unified city. In 2013, the festival returned with triumphant cacophony into Kraftwerk Berlin, a decommissioned power-plant on the banks of the river Spree, that also houses popular techno clubs Tresor and Ohm. This gargantuan industrial cathedral is where I ended up catching the closing acts of the festival, and discovered that my trip to Berlin was worth it for this alone. Walking down Köpenicker Strasse, just up the road from the infamous rock/fetish club Sage, I had no idea what I was getting into when I turned the corner and into the festival queue. The bustling arrangement of food stalls and bohemian canopies set up outside, adorned with violet LED lights, was a very stark contrast to the unrooting and all-consuming atmosphere pounding relentlessly throughout Kraftwerk. For five nights, the space becomes a futuristic mecca, haunted by the sounds of its industrial past. The venue is almost too large to comprehend- a vast expanse of hollow concrete and metal, with ceilings so high that they seem to fade into a dark, eternal abyss. Crowds clad in black scuttle relentlessly up and down the gigantic staircase, like ants drawn mindlessly to a grease spill. No matter where you in are this vast apocalyptic catacomb the sound is just as intense, with heavyweight subwoofers blending seamlessly into the surrounding darkness. Within seconds you become part of the hive, a pulse surging through your body from the floor and the walls urging you to ascend the staircase, to meet your anodic maker. When I get to the second floor I am greeted by another spectacular sight, the festival’s main stage. The audience stands motionless, a sea of sinister goth-hipster robots, awaiting command. Just arriving onto the stage are Sheffield’s own Clock DVA. They stand before a towering white screen reaching all the way into the abyss of the ceiling. Onto this screen, a slideshow of images flicker and fade, Bauhaus shapes and geometric patterns in bold, striking colours. While it is fantastic to see these pioneers of post-punk EBM in the flesh, the raw energy from earlier sets is lacking somewhat, and all older tracks have been remixed and sound cleaner. Nevertheless, people are dancing to their set, and that is saying something considering the uniform stillness of this crowd. Up next is dark ambient musician and film score composer Brian Williams, more commonly known as Lustmord. The space becomes pitch black, with only wispy Rorschach-esque markings shifting on the screen. His set is haunting and powerful, with discordant howls snaking around the room and a low throb chilling the air. It sounds as though a ghost-riddled ship is coming into dock, something that I won’t forget for a while. The visuals change and become fiery, almost like molten flesh. This amalgamation of site and sound was like being present for the opening of hell, with damned souls powering relentless machinery to keep the beat. Following this incredible act was Samuel Kerridge’s Fatal Light Attraction, a stunning audiovisual performance with an emphasis on heavy bass and metallic guitar tones. Working alongside Andrej Boleslavský & Mária Júdová, Kerridge worked a system of live coding that responded in real time to the audio source, so that the sound seemed to change with his movement. This immersive set was truly something to behold and I am looking forward to seeing the UK based artist again in the future. Next I am spoilt with a beautiful set from duo COH (Ivan Pavlov), a core member of the raster-noton collective, and Tina Frank, the graphic artist who defined the Mego aesthetic. Up on screen a world of visual micro structures spiral and blend to the beat, which on a whole is much lighter and reminiscent of futurepop, albeit with a sinister, primal screech layered beneath the melodic tones. Bitstream from Northamptonshire, known for their Depeche Mode remixes and making music for labels like Signal and Modern Love, were also lighter with a more electronic/futurepop vibe and recognizable hooks- an enjoyable listen but not quite as gripping as heavier acts. To end the festival was WSR (Emanuele Porcinai) with his electro-acoustic set, joined on stage by Koenrad Ecker of Lumisokea. It was fascinating to see them create new and unrealizable sounds by way of distortion and manipulation, and the rapturous applause at the end of the set was tribute to just how mind-blowing the whole experience had been. 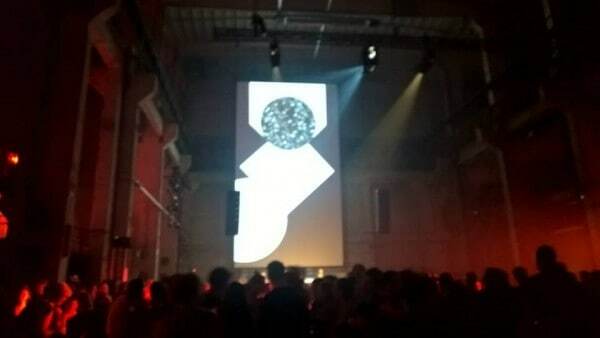 Bare in mind, I merely scratched the surface of Berlin Atonal with one day’s attendance. Also playing this year was Nine Inch Nails associate Alessandro Cortini (Sonoio), an array of talented artists from prolific Danish punk/noise label Posh Isolation, techno DJ legend Moritz von Oswald, and record producer/protagonist of B-Movie Mark Reeder. There are over 150 live acts, art exhibitions, and lectures to explore. Berlin Atonal is a phenomenon that you need to experience for yourself if you are to understand the true majesty of the ever changing experimental music scene, especially in such a raw and exciting city. Book those plane tickets in advance, because the festival will be back in 2016 with another stunning line-up.